As Monastery Initiates Second Grade, it will be your great honor to tend the Masters’ rock gardens. Each morning the Grade Ones arrive with rocks they’ve gathered and then haul away the rocks that you don’t need anymore. But there aren’t enough Grade One Initiates to go around, so there will be competition for the best selection of rocks. The Grade Ones will give their new rocks to whoever gives them the fewest old rocks to haul away. While creating your garden, remember the forbidden combinations that must be avoided! Every afternoon, the Feng Shui Masters come by to check your work. You’ll get demerits for any forbidden combinations, but you’ll also get demerits for your laziness if you don’t add new stones each day. The Masters’ final evaluation will come with no advance warning. The Initiate who has the fewest demerits will advance to Grade Three, but whoever has the most demerits will be kicked down to Grade One. Good Luck! 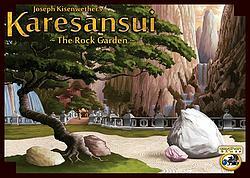 The Japanese rock garden “karesansui” (also called a Zen garden), creates a miniature stylized landscape through carefully composed arrangements of rocks and water features and uses gravel or sand that is raked to represent ripples in water. Karesansui are intended to reflect the intimate essence of nature, not its actual appearance, and to serve as an aid to meditation about the true meaning of life.